IM or Instant Messaging is simple text communication between two people (or more people) using computers or other devices at the same time, along with shared clients. The user’s text is conveyed over a network. More advanced instant messaging software clients also allow enhanced modes of communication, such as live voice or video calling. There’s many popular chat software that you can download for free such as Yahoo Instant Messenger, Windows Live Messenger, ICQ, etc.. These software will allow you to have just one account. If you have multiple account social network or IM protocols and want to manage them into one place, you can use chat software that allow you to have multiple account. The list below is best desktop chat software that support multiple account functions. 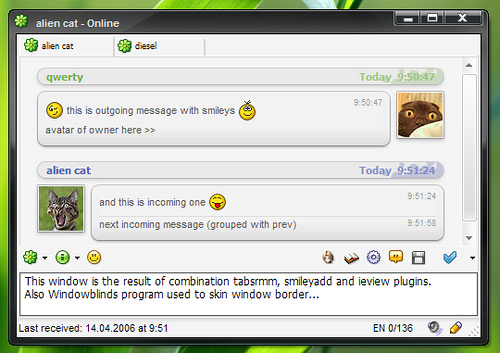 Actually, Trillian is shareware chat application, But there’s also available free version of Trillian. 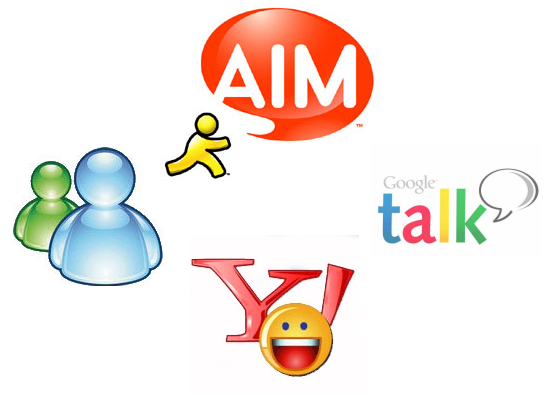 Trillian is powerfull chat software than can connect you to popular network service such as Yahoo IM, Google (Gtalk), Facebook Chat, Skype etc..
Support AIM, Windows Live, Yahoo!, Google, Facebook Chat, Jabber, Skype, Foursquare, LinkedIn, and studiVZ / meinVZ / schuelerVZ chat! 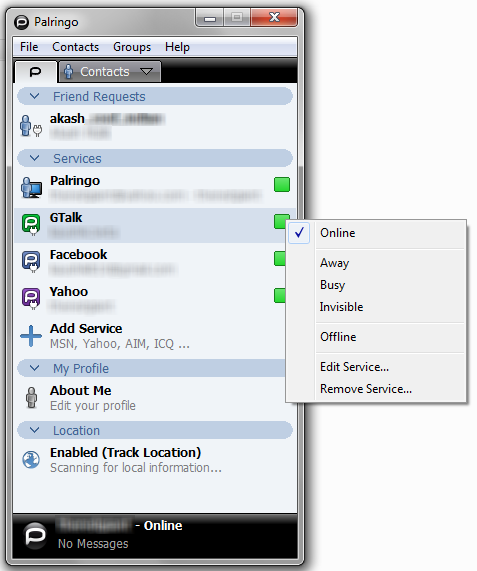 Support Windows Live Messenger (MSN), Yahoo, ICQ, AIM, Google Talk, Facebook, MySpace, Gadu-Gadu, Hyves and many more. Digsby is chat software that support multiprotocol instant messenger such as Yahoo messenger, ICQ, AIM® Facebook chat, Google Talk, and many more. Paltalk is free video chat software with many features, you can connect with anyone, anywhere, anytime with video chat, video and voice calls, text, and more. 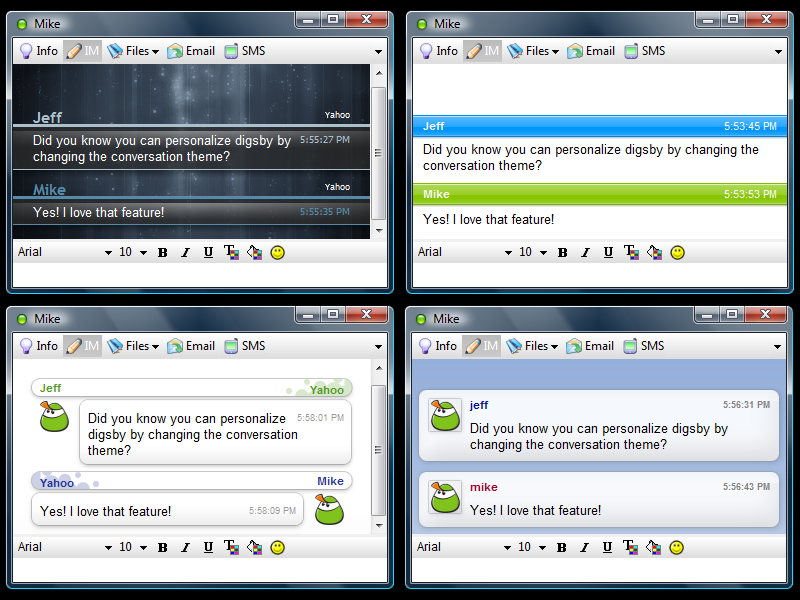 Pidgin is a chat software which lets you log in to accounts on multiple chat networks simultaneously. This means that you can be chatting with friends on MSN, talking to a friend on Google Talk, and sitting in a Yahoo chat room all at the same time. 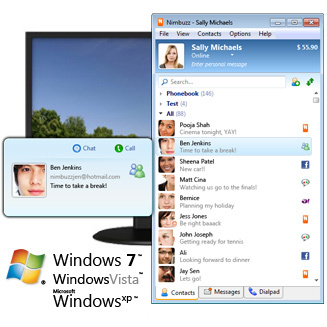 Support many popular service : AIM, ICQ, FAcebook IM, Google Talk, Jabber/XMPP, MSN Messenger, Yahoo!, Bonjour, Gadu-Gadu, IRC, Novell GroupWise Messenger, QQ, Lotus Sametime, SILC, SIMPLE, MySpaceIM, and Zephyr. 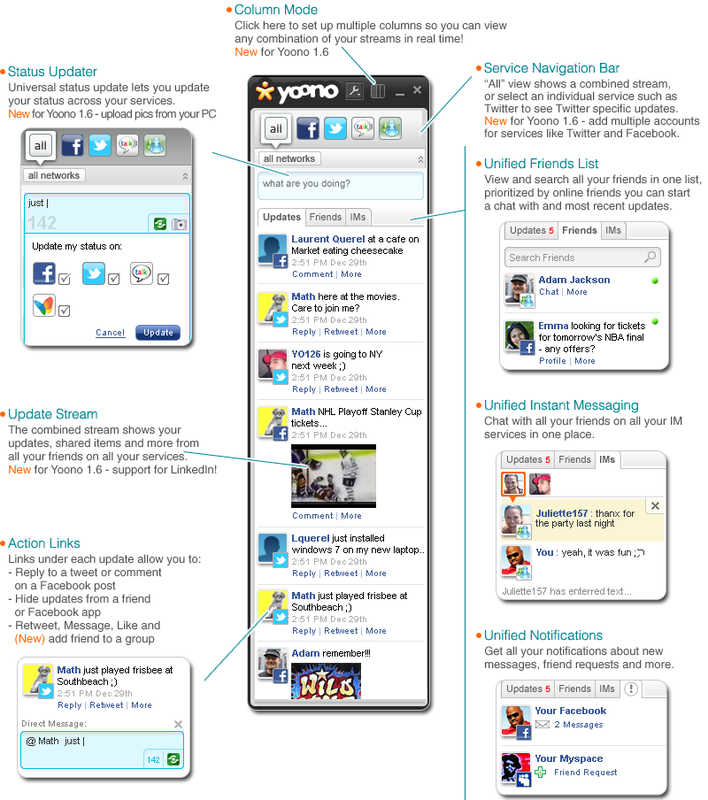 Yoono is free social network software and chat application that allow you to connect with your social network account. Doesn’t matter if you have multiple account on facebook or twitter, All your multiple account can work simultaneously together with yoono. There’s available Yoono for desktop, Browser Add-on, and Iphone Application. I think yonoo is not much better than all of us think it is. 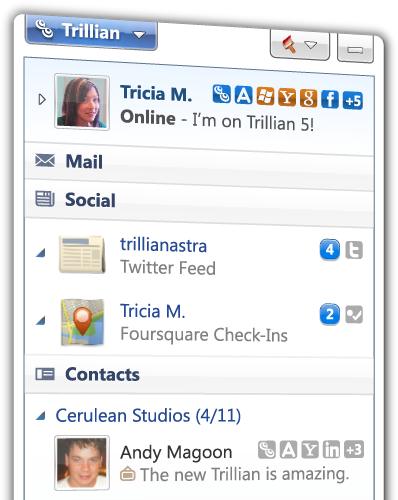 I think trillian is a great one. among all existing IM, whichever is most secure? Tried them all, unfortuantely, there isnt a single one that is a true all in one, one bugs out on something somewhere. so far for IM pidgin is the most stable, but it doesn’t support social networking, the best combo is pidgin and seesmic desktop, but im still waiting for a TRUE all in one social app, something that hosts the top messenger protocols, including voice file transfer and cam, social networks and email read/write. hopefully someone comes up with it soon cause its desperately needed with all the networks out there. I wanted to know if there is any software which can help me share music while messaging. I would greatly appreciate your help. There is a music tracker plugin for pidgin that can change your status based off of musical preferences, if that is what you’re looking for. yoono doesn’t add a google+ account…. 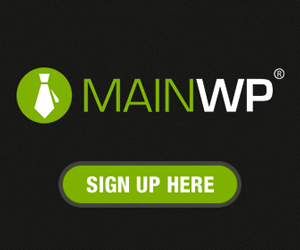 I have tried a few of the IM clients listed here while I loved Trillian (before Pro came out), I prefer not to have to pay to use a free service. I like the Miranda GUI and plug-ins, the only downside for me was the lack of chat. I like Pidgin for its portability the yahoo chat is buggy (no chat room list) at least on my tests. I like its usability and ease of use out of the box. HI,, I am using Nimbuzz but it does not support multiple facebook accounts.. any IM which supports more than 1 facebook account can be connected ? Particularly insightful thanks, I do believe your current visitors would possibly want further stories like this continue the great hard work.